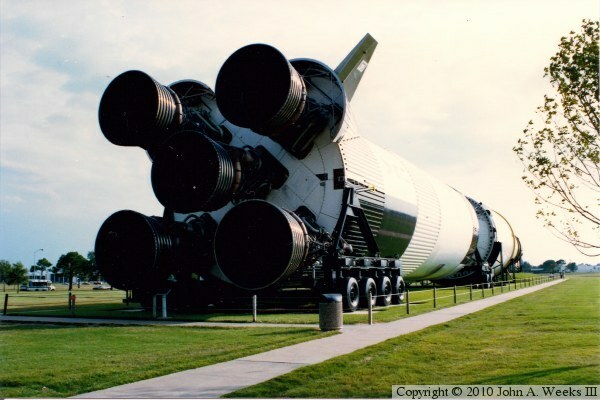 This is the 1st stage from Saturn V vehicle SA-514 on display at the Johnson Space Center in Houston, Texas. Vehicle SA-514 was intended to be used for the Apollo 18 or Apollo 19 flight to the moon. These missions were canceled after this Saturn V was completed. The upper stages were used for fit and processing testing in Florida and are now on display at KSC. The first stage was retired in the late 1970s and put on display. It was restored and moved indoors in 2005. This photo is from 1990.